St. Olaf alum Carl S. Hughes from the class of 2003 will lecture on the topic of “What Makes Kierkegaard ‘Biblical? '” in Viking Theater on the 17th of May. As an established Kierkegaard scholar, Professor Hughes will offer attendees a unique perspective on the nature of the great Danish philosopher. He has published several works on Kierkegaard, including Kierkegaard and the Staging of Desire: Rhetoric and Performance in a Theology of Eros, and he currently teaches a variety of theology courses at Texas Lutheran University in the city of Seguin, Texas. The Hong Kierkegaard Library is a special collection that serves students, scholars, and anyone interested in the writings and ideas of 19th-century Danish philosopher Søren Kierkegaard and related thinkers. The collection stands as an international center for scholarship of Kierkegaard and of existentialism more broadly housing approximately twenty thousand book volumes. Many of these comprise a collection of editions matching those owned by Kierkegaard himself as a part of the Library’s ongoing goal of recreating the philosopher’s personal library. The Library also holds collections of periodical articles, newspaper articles, and archival materials related to Kierkegaard studies, the history of the Library, and the biographies of Howard and Edna Hong. As a study and publication center, it especially welcomes all with a serious interest in Kierkegaard research. Because of the Hong Kierkegaard Library’s international prominence, the collection hosts an increasingly diverse community of scholars. In the past several years, scholars from six continents have called the Library home. Their fields have varied greatly, ranging from postcolonial studies to epistemology to translation work. 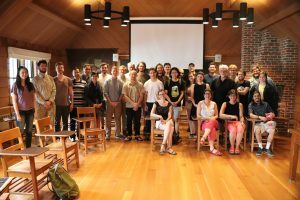 The collection’s resources and organization allow for the existence of a diverse group of scholars who gather to further their academic research and meaningfully engage with other scholars. With 20,000 book volumes, periodical and newspaper articles, and archival materials, the collection proves a valuable resource center for research in areas in philosophy and religion, but inevitably crosses disciplines in all areas of study. To get to the Hong Kierkegaard Library, go to the main entrance of the St. Olaf College Rolvaag Library, look to your right, go down the stairs, take a left, and walk to the end of the hall. The Library welcomes all learners and encourages both scholars and students alike to utilize our collection. Consider spending research time in the Library. Click on the various program tabs on the right for specific information on available opportunities along with a list of scholars from all over the country and the world who have made use of its excellent resources.